Gorgeous, Bright, Oceanfront Upstairs Apartment in our duplex - Walk to Restaurants, Entertainment, Shopping. Six Beach Badges included. Enjoy your own oceanfront getaway overlooking the blue surf of one of the loveliest beaches on the East Coast. Reasonably priced, near shopping, amusement parks, and restaurants that cater to everyone's desires. Only two hours from New York City, but 30 feet to the ocean! If you like swimming, sun-bathing, beach combing, shopping, dining out, visiting historic sites, or just sitting back and relaxing, then this oceanfront in beautiful North Beach Haven is the perfect place for your next vacation...no matter what the season! This bright, 3-bedroom upstairs apartment in our duplex has views of the Atlantic through the large picture window in the living room and two of the bedrooms. Enjoy a modern kitchen, granite counter tops, Flat-Screen TV, wireless internet, central air, new paint, carpets. All kitchen niceties such as granite counters, blender, toaster, microwave, dishwasher, refrigerator, make this the perfect vacation. The large living/dining room, which looks out through a picture window over the ocean, is furnished with flat-screen TV with cable. While away the days on your large private deck overlooking the ocean or cruise the miles of lightly populated white sand beach. Watch sunrises over the ocean from your bedroom or living room window or the spacious deck. Then see the sun set over the bay just a couple of blocks away. Absolutely amazing! 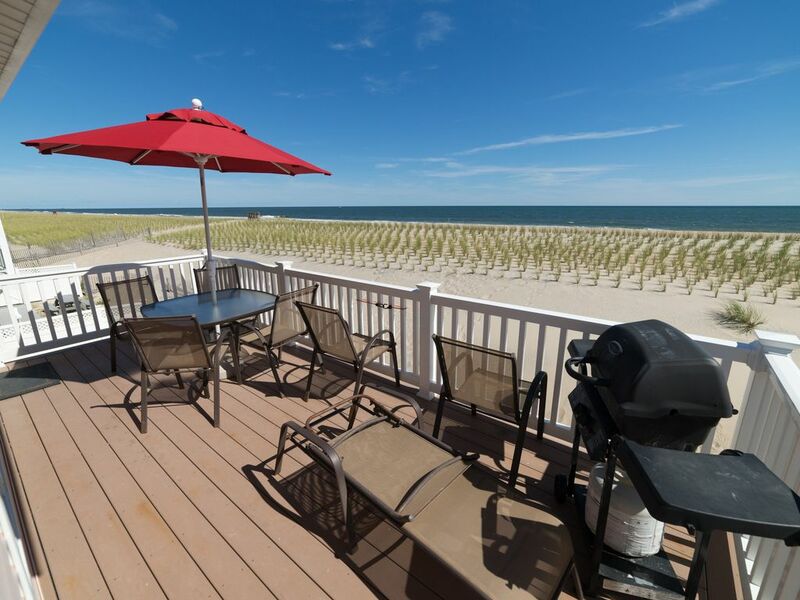 This beautiful oceanfront is located in one of the most desirable family vacation areas on the New Jersey Shore. Very reasonably priced for the Jersey Shore - compare and see! This oceanfront goes fast in the summer - so contact the owner now! Amenities: 3 beautiful bedrooms, including a master bedroom with private bath. Central air. Fully equipped kitchen, microwave, dishwasher, washer/dryer, flat screen TV, DVD. Outside shower, gas grill. High-speed wireless internet access included! Activities: Fantasy Island Amusement Park, Arcade, Miniature Golf, Fishing, Boating, Atlantic City 30 minutes away, Restaurants, Shopping, Water sports, Lots of Fun! You'll be right on the ocean! Our stay could not have been better, not only are the views from the deck fantastic, there is nothing like listening to the waves as you drift away to sleep. Couldn't have asked for more beautiful oceanfront getaway! The ocean is literally breathtaking from the view in the living room. We saw dolphins from our deck. The house is very nice and bright. We climbed the barnegat lighthouse and had complete rest and relaxation. Zhava was very responsive to any questions we had. We would highly recommend this property. The house is clean, comfortable, bright and airy with outstanding views from living room and two bedrooms. The owner was very responsive and helpful. And if you must be online, the wifi is excellent. We will definitely go back, God willing! My wife and I stayed at Zhava's get away as I was recuperating from minor surgery. Her home was immaculate, warm and welcoming. The first thing I did was to send a pic from the living room looking out at the ocean. The next thing was a long walk. October is beautiful as it is still warm enough to enjoy the beach and see so many monarch butterflies on their migration south. Zhava is a gracious and responsive owner. I recommend her home without hesitation. Wonderful Property! Friendly and Helpful Owner! This property has everything as advertised and more! Oceanfront, clean, plenty of space, well stocked, and within walking distance of restaurants and attractions. Pictures are accurate. Instructions were clear and complete. Even a handyman is nearby. Owner was immediately responsive, friendly and helpful. I felt so comfortable renting one unit, that when family and friends decided to join us, I rented the second unit too. I highly recommend this property! Had a wonderful time at this house. The kitchen had everything you need, the beds and pillows were comfy, and the location was great! There was a mix-up upon arrival with the cleaning service, but Zhava (owner) handled it immediately. She was terrific to deal with - very responsive. Loved sitting on that deck looking at the ocean! PLEASE NOTE: Rates may change depending on availability. Please email owner for details. Spring, fall and winter off-season rates are significantly lower and change by the week. Periodic special rates are offered as well, depending on availability. Contact owner to request a quote for your specific time period. Rates are subject to change until reservation is confirmed.